“Blue is glory and power, a wave, a particle, a vibration, a resonance, a spirit, a passion, a memory, a vanity, a metaphor, a dream. 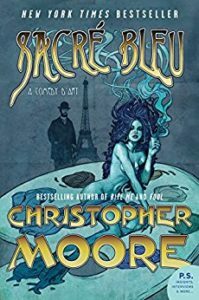 I have read and enjoyed a number of novels by Christopher Moore and they all have been a bit unusual. Sacre Bleu: A Comedy d’Art takes place in France circa the late 1800’s at a time when some of the most famous painters in history were active. Told mostly through the eyes of a baker’s son who wants nothing more than to NOT bake and just paint. Something strange seems to happen to some of the artists, the color bleu, a beautiful muse, and bread. Okay the bread part may be a stretch. This is not an art novel, but more of a murder mystery set in a lively bohemian time in history. You’ll recognize some of the famous characters in the story and I’ll admit to being too lazy to type them in here. Perhaps you’ll wonder like I about how much of the story is fact and how much is fiction. This is an interesting read. This article was published on Aug 6, 2018 . It is tagged christopher moore, Sacre Bleu: A Comedy d'Art. You can follow any responses to this article through the comment RSS feed.